An exciting nationwide football event ‘PTCL Teens Football Tournament’ was organized for children of PTCL’s employees, aged 16 to 19 years, at Sports Complex, Islamabad. The tournament, including the semi-final and final matches, took place over the span of 5 days. The purpose of the tournament was to promote healthy activities for PTCL families. PTCL created an opportunity for a teenager which encourages them to have a healthy lifestyle. The company remains committed to the well-being of its employees, and their families. These events were largely attended by PTCL employees, given football’s status as a popular sport in Pakistan. There were a total of three teams, i.e. Headquarters (HQs), Islamabad Telecom Region (ITR) and Rawalpindi Telecom Region (RTR), which consisted of 16 players each. The teenagers, who were unable to make it to the teams, were kept as substitute players. It was an exhilarating event for the teenagers, during their summer break, before they head back to their educational institutions. PTCL continues to look for ways to positively impact the communities in which it operates, and to remain an inspiration for its staff. 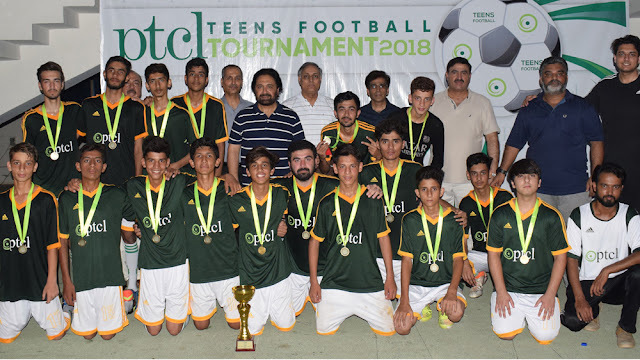 PTCL is keen to ensure employees and their children take part in all of the company’s sports events for the physical wellbeing and healthy lifestyle. PTCL has a tradition & culture to promote sports activities within the organization. Earlier this year, a mega sports gala was organized by the company during which employees and their families participated in a variety of sports activities.